MOST people’s knowledge of their family tree goes about as far back as the names of their parents’ mother and father. And East Lancashire publican Jonathan Myerscough was no different. But a letter received out of the blue was to change Jonathan’s perceptions of his family history forever. Jonathan and wife Marina left their home town of West Derby, Liverpool, for Bashall Eaves, near Clitheroe, in August 2005 after buying the then-dilapidated farmers' watering hole The Red Pump Inn. Both successful business professionals — Jonathan in the golf and leisure industry and Martina in the corporate world — the couple had decided to quit the stress and strains of modern life and open a country pub together. “It had got to a point where I was fed-up of sitting on motorways and in traffic jams all the time,” said Jonathan. “Martina was having to drive an hour-and-a-half to work and back every day and we just put our heads together and said: ‘Right, let’s do it, let’s see what’s out there.’ “We searched all over the place. We looked in Cumbria, West Lancashire, Cheshire, and even toyed with Devon and Cornwall. Although the couple had no experience of running a pub, they hit the ground running, establishing it as a cosy country inn serving traditional locally-sourced food. Soon they found themselves earning mentions in prestigious foodie bibles the AA Good Pub Guide, Alastair Sawday’s Special Places Guide, The Michelin Guide and The Best Pubs and Inns of Britain. At a time when most pubs were struggling to stay afloat, this was particularly notable. It wasn’t long before a local magazine ran an article on them, with the heading Bucking the Trend. It was this story that would open a door to Jonathan’s past and change the way he looked at his ancestors forever. He explained: “About three or four weeks after the article ran this letter turned up, very nicely hand-written and addressed to me. “We’d just done a busy lunch shift and I opened the letter over a cup of coffee. "It read: ‘Dear Jonathan, I hope you don’t mind me writing to you. "'You may be interested to know that I've been researching the Myerscough family tree in the area and that you have a distant relative eight generations back who lived close by at Moss Barn Farm in Bashall Eaves’. “I though it was a wind-up at first because we’d had a few jokes played on us since we’d been here,” continued Jonathan. “I showed the letter to Martina and we had a think about it and in the end we got in touch with the author of the letter. "It turned out that it was a lady called Agnes Myerscough from Longton, near Preston. She was a maths teacher who had retired 20 years ago, got bored and had began researching her family tree. Agnes sent a family tree of the Myerscoughs and they were stunned to see that Jonathan’s great-great-great-great-great-great-great-great grandfather John Masco had lived in the nearest farm to the Red Pump Inn and toiled the land adjacent to the pub in the 1750s. The pair realised that it was likely that John Masco had probably even been a customer at the pub, where he would likely have supped ale with fellow farmers. “When we saw it all written down in black and white it was quite surreal to say the least,” admitted Jonathan. “Agnes brought a party of Myerscough family researchers to the pub one afternoon and it was quite freaky to have all these people in one place who were connected by these two family lines. As to the question of whether the extraordinary turn of events is just coincidence or something more, Jonathan is undecided. “When I first walked in through the door there was definitely just something about the place that felt right, even though at the time it was decorated garishly, as an Italian restaurant, but I didn’t immediately feel like I was home or anything,” said Jonathan. “This whole thing has certainly made me think, though. 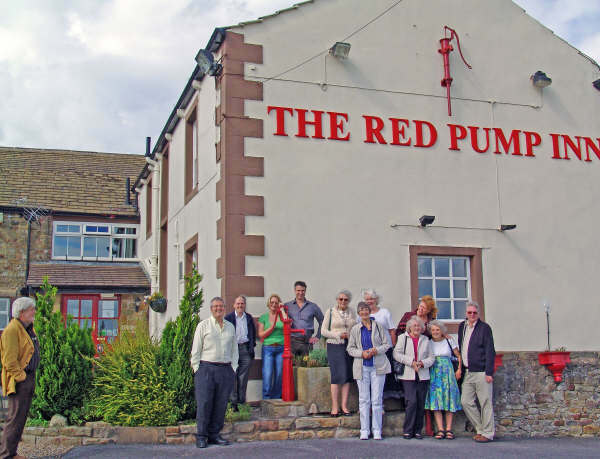 Business is still thriving at the Red Pump Inn. They now have three letting bedrooms, have received a Silver Award from Visit Britain and a Highest Quality Assured award by Taste Lancashire. “We’re a bit different because of the fact that neither of us has been through the professional ranks in the pub trade,” said Jonathan. “If Gordon Ramsay came here I’m sure he’d say: ‘You’re doing it all wrong’. "But we must be doing something right because the people who come here like it. "When we open the door it’s an extension of our home and our food is different. "It’s not commercially driven, but done for the love of the food. And Jonathan’s historical link to the area makes the couple feel even more connected to their business. “Discovering about my heritage does make me feel differently about the place I suppose,” said Jonathan. “I keep expecting someone to walk through the door saying: ‘Hello, I’m related to you’. But that’s not happened yet!"